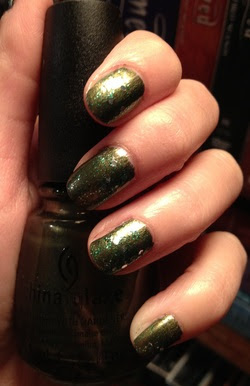 With St. Patty's Day just around the corner, we thought we'd be festive and put a little green into our nails. As I have mentioned before, I have a harder time pulling off greens (and blues) since I'm a warmer tone skin color. I've just recently discovered that not all greens are created equally and that there are some exceptions to this! Warmer greens (with a yellower undertone as opposed to a blue one) suits my skin tone, and I'm developing a new love for green polishes! For the base color I used one coat of China Glaze's Agro. I had originally passed up picking up this shade from the Hunger Games collection, but upon trying out Allison's bottle for this nail look, I loved it so much, and had to pick up my own! You definitely can build up the color and put on another layer, but I just decided to stick with one since one coat already gave it full coverage. On top of that I used OPI's Fresh Frog of Bel Air (I know, cute name, right? ), a green glitter with silver hexagonal flecks interspersed within it. Finished it off with top coat. Absolutely loving this combo, definitely can't wait to wear it out to grab a drink at the pub this upcoming Saturday. We're hoping they're serving green drinks! Happy St. Patrick's Day! OPI New York City Ballet Swatches!